What can I say about Gelato? Yes it is Italian Ice Cream but it is so much better! Do you like soft ice cream? When you were a kid (and maybe as an adult), did you stir your ice cream to make it soft? Ice cream was never intended to be served frozen. Once ice crystals form the texture is changed. It is no longer creamy. Staring softens the crystals and allows the creamy texture to return. The best ice cream is one that has never been frozen. Ice cream is perishable and because of that we freeze it hard. My solution is to serve it at the proper temperature without ice crystals and eat it up so none is left to go bad. Do you agree? Gelato is a different recipe than ice cream. Ice cream legally has to be at least 10% fat but gelato is more milk to cream so the fat content is more like 5% to 7%. Gelato is also stirred less and at slower speeds. This causes less air to get into the mixture and creates a denser consistently. The real test is in tasting it. Everyone that goes to Italy and stops in a gelateria knows how delicious gelato is. That first taste in your mouth delivers a wonderful texture and great flavors. What a way to cool down on a hot day. 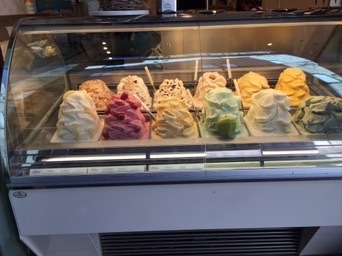 Gelato may not be enough of a justification to go to Italy but if you are there, you must try it! In any gelateria, they will give you tastes of several flavors on very small spoons. Then you can order what you want. You order it by how many scoops you want. Each can be the same flavor or different flavors. Remember in Italy most bars and gelaterias require you to pay first and take the receipt to the counter to order. My favorite flavor is nocciola (Hazelnut). It is light brown in color and has a wonderful nutty flavor. What is your favorite flavor? My favourite is also Nocciola. A gelato a day while in Italy is my mantra. George, Here’s a question I think you can help me with. As a kid we always had a choice of spumoni or tortoni at Romano’s Restaurant in Brooklyn. The spumoni was like ice cream and had three flavors in the serving: vanilla, chocolate and strawberry. Sometimes there were pistachio nuts in it, too. The tortoni was a small serving of vanilla ice cream in a fluted paper cup. It was topped with toasted nuts of some kind and a sliced maraschino cherry. Does anything like this exist in Italy or is it something they created here in the U.S.? Neither one was soft like a gelato. Emily Ann they are from Naples originally like most Italian American foods. They are not often seen in Italy except in factory productions and tourist areas. Gelato took over allover Italy and Europe.